This week is going to be Stuart Gordon Week. When you find out Friday’s movie review, you’ll see why. Stuart Gordon is a prolific 80s-90s director probably most famous for directing The Re-animator, but he’s also directed several other cult horror favorites. One of which I’ll talk about more tomorrow. 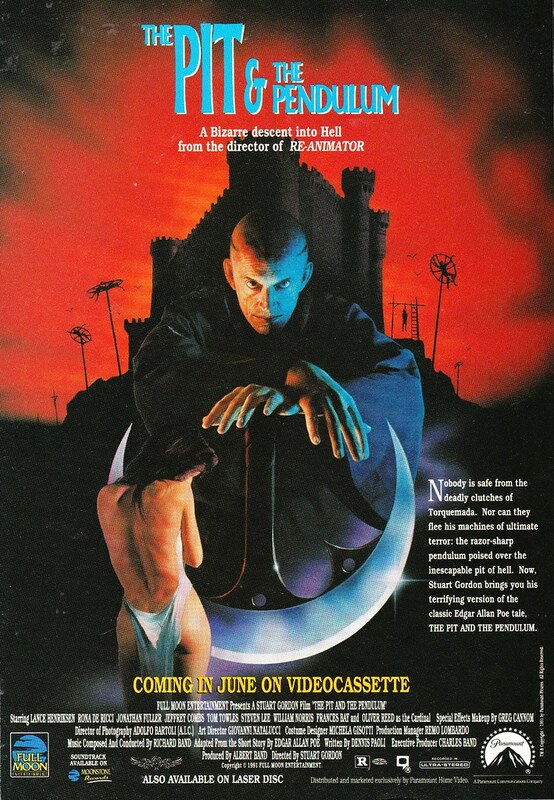 Today, I’m showing you a 1991 home video ad for Gordon’s The Pit and the Pendulum (1991) starring Lance Henriksen, Jeffrey Combs and Oliver Reed. I haven’t seen it, but I think it looks AMAZING. This movie looks seven different kinds of awesome. It’s B movie cheese all the way. Check out the trailer. You know what, now that I’ve watched this trailer, I think I’ve seen parts of this on cable I just didn’t know what it was called. This entry was posted on October 13, 2014 at 8:00 am and is filed under Fangoria, Genres, Halloween, holiday, horror, magazine, movies, nostalgia, pop culture with tags AWESOME-tober-fest, AWESOME-tober-fest 2014, Fangoria, Halloween, magazines, movies, nostalgia. You can follow any responses to this entry through the RSS 2.0 feed. You can skip to the end and leave a response. Pinging is currently not allowed.